In 2018, single taxpayers will deduct $6,500, and married couples will deduct $13,000. Then, taxpayers can add in exemptions — $4,150 for each qualifying person, including oneself. For a single person, this comes out to $10,650. For a hypothetical two-parent home with two kids, it would come out to $13,000 plus four times $4,150, or $29,600. A single taxpayer would deduct $12,000, a head of household would deduct $18,000, and a married couple would deduct $24,000. However, none will tack on any additional exemptions. This means that single person would deduct $12,000 and not $10,650. The single parent would deduct $18,000 and not $17,650. 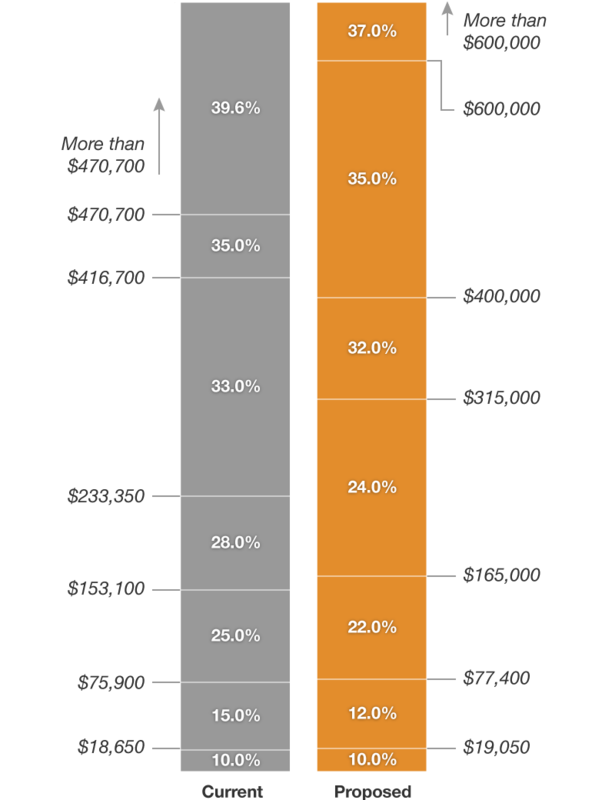 Meanwhile, the two-parent home with two kids would get a $24,000 deduction now, not $29,600. However, that household could also get a bigger child tax credit. In other words, the total of the standard deduction plus exemptions would be smaller for some families with multiple children than it was before. The repeal of personal exemptions would sunset after 2025. A nearly doubled standard deduction would also mean fewer taxpayers itemizing their deductions, which Republicans argue would make it easier to do their taxes. Taxpayers deduct a set amount — $4,150 per qualifying child — from their taxable income. Then, they apply the child tax credit by subtracting up to $1,000 per child from the final tax bill. (The total amount depends on a tax filer’s income; the credit phases out as income gets higher.) People can apply for a refundable additional child tax credit, which gives them some money back if their total tax liability is zero. Employees can exclude the value of up to $5,000 in employer-provided dependent care assistance from their income. In these programs, employers might reimburse employees for child care by means of a flexible spending account, for example. People can also get a child and dependent care credit of up to $3,000 for the cost of caring for a child or other dependent (or $6,000 for more than one child or dependent). In addition, there is an adoption tax credit of $13,750 per child. Taxpayers would not apply exemptions for their children. They would, however, apply a larger child tax credit, of up to $2,000 per child. This could help families make up for the loss of exemptions (as explained above). It would also make the credit refundable up to $1,400 — meaning that people who owe nothing in federal income taxes could still get up to $1,400 back from this tax credit. The bill would create an additional $500 tax credit for nonchild dependents. These provisions would expire after 2025. The bill also keeps the adoption tax credit and the dependent care exclusion. Taxpayers can contribute up to $18,500 in pretax income to tax-preferred retirement accounts like 401(k)s for tax year 2018. Despite some talk initially of lowering the limit on 401(k) contributions, this would not change. Tax filers who itemize deductions can deduct different types of state and local taxes from their taxable income on their federal tax returns. Itemizers could still deduct state and local taxes, but only up to $10,000. That $10,000 could include property taxes and either sales or income taxes. Taxes must be paid on any estate with assets worth more than $5.6 million for tax year 2018 (or $11.2 million per married couple). The tax rate on those assets ranges from 18 percent to 40 percent, depending on the size of the estate. Right now, only a tiny sliver of the very wealthiest estates are subject to this tax. The estate tax exemption would immediately double, meaning individual estates would be taxed only on assets of more than $11.2 million for tax year 2018. The bill would allow pass-through-business owners to deduct a portion of their business income. The deductible amount would be smaller for some higher-income pass throughs. In addition, the bill includes provisions to try to keep high-income wage earners from converting to pass-through businesses to take advantage of the deduction. Altogether, the bill would limit the effective tax rate on these businesses to no more than 29.6 percent. Homeowners who itemize their deductions can deduct the interest paid on up to $1 million of their mortgage principal. The deduction would be limited to up to $750,000 of new mortgages, not $1 million. It would allow homeowners to deduct the interest on mortgages from both first and second homes and would not affect existing mortgages. The provision would expire after 2025. Taxpayers can deduct the cost of out-of-pocket medical expenses, if the total cost exceeds 10 percent of the taxpayer’s adjusted gross income. The bill would lower the floor for deductible expenses to 7.5 percent of adjusted gross income, but only in 2018 and 2019. It would revert to 10 percent in 2020. A variety of tax policies benefit current students and college graduates. Taxpayers whose colleges or universities give them tuition reductions, often called “tuition waivers,” can exclude that amount from their income. Workers may also exclude up to $5,250 in employer-provided education assistance from their taxes. Taxpayers may also deduct some tuition and student loan interest payments from their taxes. In addition, tax credits including the American opportunity tax credit, Hope Scholarship credit and lifetime learning credit help students afford their education. The bill would preserve these credits, as well as tuition waivers. The individual mandate penalty would be reduced to zero. This would mean some people would choose not to purchase insurance and that others would not be able to afford it.